Where did you leave the car? Which way is back to the trailhead? Where to return to your buried treasure? 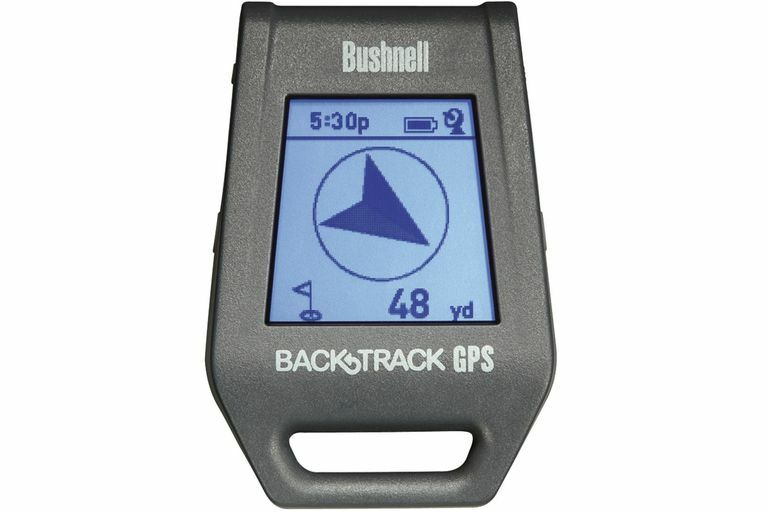 The Bushnell BackTrack Point-5 GPS helps you find your way back. It is extremely simple to use to mark up to five locations at a time, then navigate to any of them with an arrow display and distance reading. It also has a digital compass, thermometer, and altimeter. It fits comfortably in your hand and weighs little. It works on two AAA batteries and has a backlight. I can see several scenarios in which it is just what I need -- such as finding my unfamiliar rental car in a crowded parking lot. The Bushnell BackTrack Point-5 allows you to mark up to five different locations at a time. Just go outdoors (it doesn't work well indoors) turn the power on, give it a couple of seconds to locate the GPS satellites, and press the Mark key. Now you will be able to navigate back to that location. It has five icons that you can assign. One is a little house, a car, a star, a flag, and a bullseye. To mark another location, turn it on if it isn't already, and hit the power button to advance to the next icon, then press the Mark button for a couple of seconds until it shows that it has set the location. When you want to find your way back to any of your saved locations, you turn on the BackTrack, scroll through the different points if necessary to find the one you want. It shows an arrow pointing back to that location, with distance. For distances under 1000 yards, it shows the number of yards. For distances over 1000 yards, it shows tenths of miles. You can switch to meters and kilometers if you prefer. As you move, it updates to show you how far you are from your destination point. What it doesn't show you is a map. No, this just points in the direction of where the saved location is relative to where you are now. It's up to you to pick your way there safely. There may be a pool of piranha in between you and your saved location. You will have to find your own way around that. All this does is keep pointing which way your destination is and how far you are from it. All screens show the time of day, which is determined by the GPS satellites. The Mark button doubles as the backlight button. A second screen shows a digital compass, with your present coordinates. This could be useful for orienteering or geocaching. However, you can't enter coordinates to set a location, so it is not a great device for those sports. The third screen has an altimeter showing your elevation above sea level (or, presumably, below it if you are visiting the Dead Sea or Death Valley). It also shows the temperature. I had a problem with this, as carrying it in my hand seemed to warm it up to body temperature. I know it was only about 70F outside when I went walking, but the BackTrack was reading a balmy 80F to a roasting 90F. Maybe I just have hot hands, but I wouldn't trust the temperature unless you hadn't been holding it. Here is your big chance to make a mistake. Let's say you are staying at a hotel and you first mark your room as a location with the little house icon. I have trouble remembering my room number since the keycards don't have it on them. You go to your rental car and head out to a popular trailhead, parking your unfamiliar car in a large, crowded parking lot. You want to set your car location so you can find it. You turn on the BackTrack with the power button, showing the screen with the house icon location of your hotel room. But instead of hitting the power button again to progress to the car icon and set that mark, you press the mark button again on the house icon for a couple of seconds. This sets the house icon for the car location and erases what you have stored in your hotel room location. This is not a fatal problem as you can probably ask the desk clerk what your room number was. But if you are on the trail and marking points along the way, you could overwrite the trailhead location by mistake. Be careful. Is the BackTrack What You Really Want? I see the BackTrack as having fairly specific uses. It's what you want when you literally just want to find your way back to a previously visited location. - Set a location that you aren't standing in. - Find your way to a place you didn't previously visit and set as a location. - Use to find a moving object, such as a person. Or, if they steal your car, you can find your way to where it was parked. But dude, the car is gone. - Figure out how to get from where you are to the location you set to get back to. It doesn't have any maps. If you want to do any of that, then you need a different kind of GPS or a cell phone app. I like that it works wherever you can pick up a GPS signal, in comparison to a cell phone app that may not work if you are out of cell phone and Wi-Fi range. I love the simplicity of using it. It is very easy to figure out and something you can use a few times put it away for weeks, and still remember how to operate. I really love a gizmo that helps me find my car, I can see taking this along on hikes in addition to a good trail map, It is always wise to have a compass, and great to have an arrow pointing back the right way. Just use your own good judgment about navigating back and avoiding hazards.